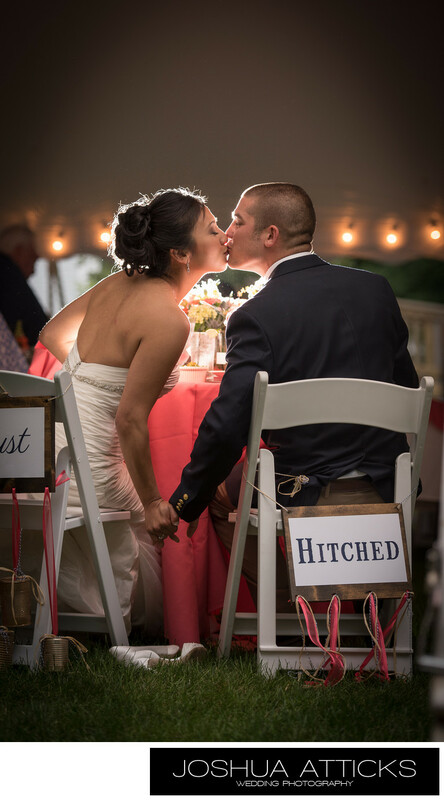 Gorgeous - Emily and Tyler share a kiss as they enjoy their reception at the Barn on Walnut Hill. The reception was under a huge tent where dinner was served followed by dancing up at the barn. I love how they are holding hands below with a backlight kiss above. Their chairs are perfectly decorated with Just Hitched written on the back and some rattling cans dragging beneth. The ferry lights in the forground add further ambiance. Love this shot! Location: Barn on Walnut Hill, North Yarmouth.